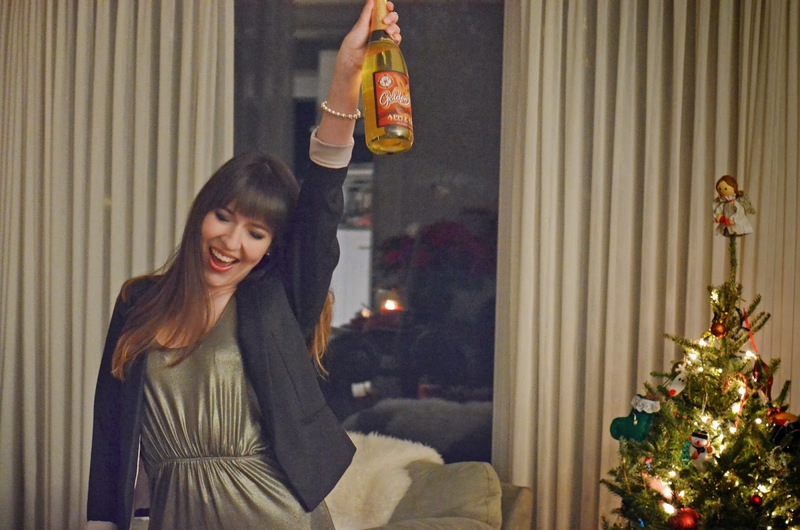 New Year's Eve Outfit + Plans for 2014! I had a quiet New Year's Eve, but that doesn't mean I didn't dress up, because I absolutely did. I took the opportunity to send my secondhand Alexander Wang dress on its maiden voyage, and it certainly did not disappoint! 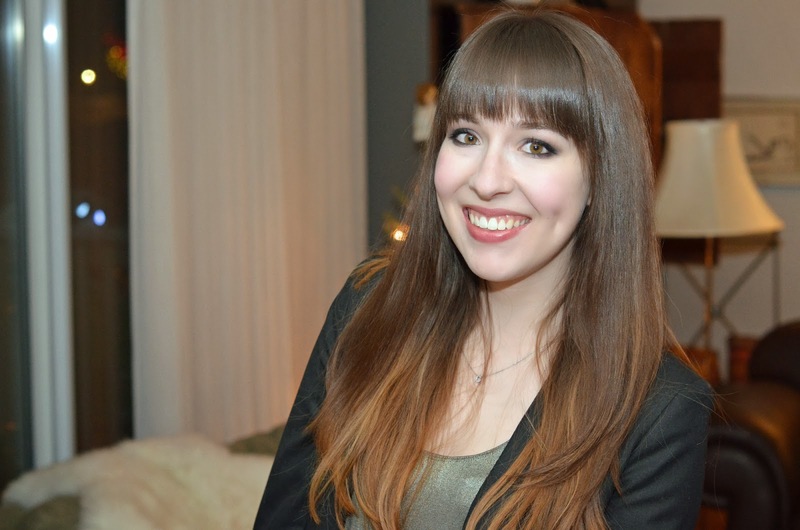 The shimmer and glimmer of the dress was perfect for the occasion, and I felt very festive and in-the-moment. I paired it with all black, since the dress needed tights, and my only pair in decent condition are black. So, on went a black blazer and black shoes! 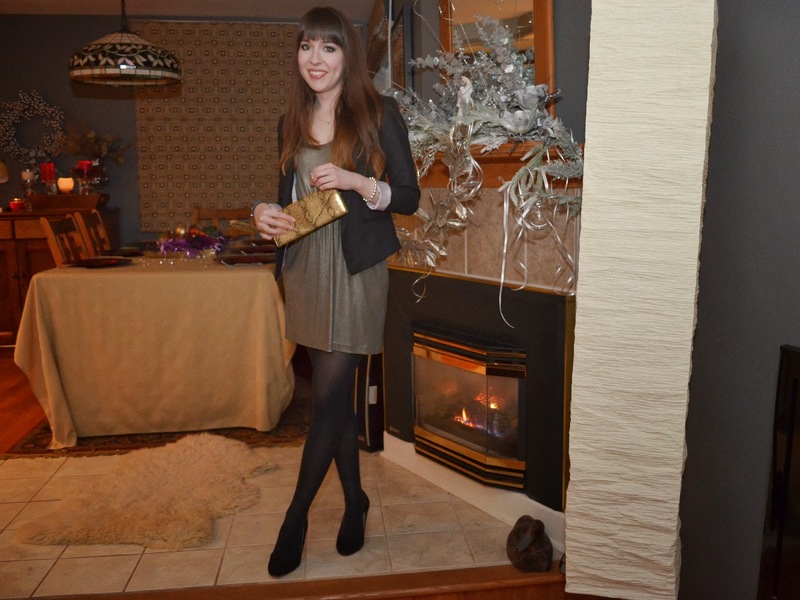 I did have a bit of extra sparkle with my clutch, so I didn't totally play it safe. As for my plans for this year, one of my top priorities will be becoming much more consistent with my blogging and YouTube-ing. I have such a hectic work schedule that it's hard to find time, but I'm going to make the time. I really love creating content and coming up with new ideas to share with you all, so there you have it, my declaration that I will be more active on here! As for other, less serious resolutions, I do have a new video on my YouTube channel in which I discuss my Beauty Resolutions for the new year. I have quite a few and it's going to be tough to stick to them all, but I'm going to do my best! As for my makeup, I'm pretty disappointed that the dark and sparkly smokey eye I did isn't showing up here. Darn these hooded eyes! I finally used the black/blue sparkle Barry M dazzle dust I bought while I was in the UK, paired with MACs Vex, along some more normal shades from my LORAC Pro palette. It was pretty badass if I do say so myself, and the fact that it has gone undocumented has me pretty bummed out. I hope you all had a fun, safe, and happy new year, and that you're as optimistic about 2014 as I am! Things are on the upward swing, I just know it :) In a last-ditch effort at self-promotion (which I am absolutely terrible at, in case you hadn't noticed!) I would love it if you would kick off the new year by following me on any social media platforms you use. I'm turning into a bit of an Instagram nut, and I'm not even sorry. One of my photos got 35 likes in 3 days, and I felt like a rockstar. Thank you all so much for your comments, likes, and support this year. You have no idea how much you are appreciated and treasured! P.S. : You look fab in the pictures! I'm really digging the midi rings, and that Tiffany bracelet = <3. So simple, yet so chic.